Kidney transplantation is the best way to treat kidney failure or end-stage renal disease (ESRD). The benefits of a successful kidney transplant are many. Most people find they have increased stamina and energy. They can return to a more normal lifestyle, and those who were dependent upon dialysis can enjoy newfound freedom. Over the years, the number of successful transplants has continued to grow. However, if a kidney transplant is not successful, the recipient can return to a regular dialysis schedule. It is possible to undergo more than one transplant. Q. Where does a kidney come from ? Kidneys for transplantation come from two different sources - living donors, or non-living (cadaveric) donors. Living donors are usually immediate family members or sometimes spouses. Cadaver kidneys are obtained from persons who have willed their kidneys before their death by signing organ donor cards. Permission for donation can also be given by the descendent's family at the time of death. All donors are carefully screened to prevent any transmissible diseases. Q. How is the right kidney found for me ? Determining in advance whether a donated kidney is likely to be tolerated by your body is crucial to the success of your transplant. It is essential that your blood type and the donor's blood type - whether Type A, B, AB, or O - be compatible. Your tissue type and the donor's must also be compatible. We use an HLA (human leukocyte antigens) blood test to determine your tissue type, which is the unique design of the tissue antigens that you inherited. Your blood will also be tested to determine whether you have antibodies to other tissue. Antibodies are substances your body produces to destroy foreign materials. While you wait for a kidney, you are asked to supply several tubes of blood each month to monitor these antibodies. Some of the blood will be stored and used for testing compatibility with potential donors. All blood tests are performed in the Tissue Typing Lab. Kidney transplantation involves placing a healthy kidney into the body where it can perform all of the functions that a failing kidney cannot. In most cases, the diseased kidneys, located in the back area, remain undisturbed. 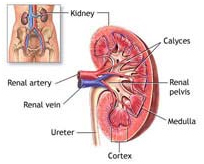 The new kidney is positioned in the pelvic area where it is surgically connected to nearby blood vessels. Thanks to years of experience, research, and improved medications that prevent rejection, kidney transplants are overwhelmingly successful and post-operative complications for transplant patients are few. On average, 85-90% of kidney transplants are successful for at least two years, the traditional measurement point for success, and most for many years more. Q. Where does your new kidney come from ? Q. What happens during the kidney transplant procedure ? The new kidney is placed on the lower right or left side of your abdomen where it is surgically connected to nearby blood vessels. Placing the kidney in this position allows it to be easily connected to blood vessels and the bladder. The vein and artery of your new kidney are attached to your vein and artery. The new kidney's ureter is attached to your bladder to allow urine to pass out of your body. Q. What happens to my old kidneys ? Q. What are the benefits of kidney transplantation ? A successful kidney transplant gives you increased strength, stamina, and energy. After transplantation, you should be able to return to a more normal lifestyle and have more control over your daily living. You can have a normal diet and more normal fluid intake. If you were dependent on dialysis before the transplant, you'll have more freedom because you won't be bound to your dialysis schedules. Anemia, a common problem with kidney failure, might be corrected after transplantation. If you have hypertension (high blood pressure), you could be on fewer blood pressure medications after transplantation. Q. What are the risks of kidney transplantation ? The risks of kidney transplantation are the same as those of any surgery. There is the risk of bleeding, infection, or breathing problems. You also might experience some side effects from the medications, and you could be more prone to infections, since the medicine you will take after transplantation lowers your body's ability to fight infection. There is also the risk of rejection. Since the body recognizes the new kidney as a foreign object, it will normally try to get rid of it or "reject" it. However, you are given medicine to prevent rejection. Because of years of experience, research, and improved medicines that prevent rejection, kidney transplants are very successful with few complications after transplantation. There is an ever-increasing demand for living kidney donors. Until recently, kidney donation from a living donor could only be accomplished through a surgical procedure called open nephrectomy (kidney removal). This procedure requires a large, muscle-cutting abdominal incision, removal of a rib and a relatively longer hospital stay and recovery period. However, advances in laparoscopic surgery have made an advanced surgical procedure called laparoscopic donor nephrectomy possible. 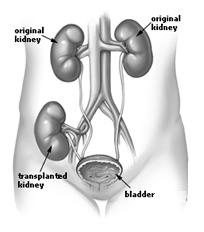 This procedure has significant benefits over the traditional open surgery for kidney donation. Q. What is laparoscopic donor nephrectomy ? Laparoscopy - also known as "keyhole surgery" - is a minimally invasive surgical procedure in which a special camera called a laparoscope is used to produce an inside view of the abdominal cavity. Surgeons use the laparoscope, which transmits a real-life picture of the internal organs to a video monitor, to guide them through surgical procedures. The laparoscope magnifies these images many times their actual size, providing surgeons with a superior view of the abdomen. Laparoscopic nephrectomy is a minimally invasive procedure that uses a laparoscope to remove a kidney for donation. Laparoscopic kidney removal is considered minimally invasive because it only requires three or four small non-muscle-cutting incisions rather than one large muscle-cutting incision in the abdomen. (See below). 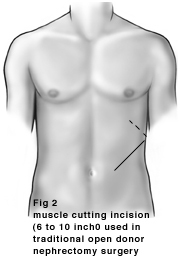 Three half-inch incisions in the abdomen; one 2.5 to 3 inch incision low in the abdomen, in the bikini area. No muscle is cut during any of these incisions. During the procedure, carbon dioxide is passed through one of the incisions into the abdominal cavity to lift the abdominal wall away from the organs below, creating more operating space to perform the surgery. The pencil-thin laparoscope and surgical instruments are then inserted through the other incisions. At the end of the procedure, the kidney is removed through a 7 cm, non-muscle-cutting incision in the bikini area. Q. What are the advantages of laparoscopic donor nephrectomy ? Because laparoscopic donor nephrectomy is a minimally invasive procedure, donor patients experience significantly less discomfort, have a shorter recovery period and return to work quicker than a donor who has had traditional open surgery. Because the incisions are small, laparoscopic donor nephrectomy causes reduced post-operative pain and shorter hospital stays, and patients experience a quicker return to normal eating habits and daily activities. See the next page for a comparison between laparoscopic and open nephrectomy. Q. Who is a candidate for laparoscopic donor nephrectomy ? A physician will complete a preoperative evaluation to ensure that laparoscopic nephrectomy is appropriate for you. However, in a small percentage of cases, even approved laparoscopic procedures may be converted to open procedures. The pre-transplant donor evaluation provides complete information about your overall health and helps to identify any potential problems. During your evaluation you will have several tests performed, including a renal arteriogram, which examines the vascular system of the kidneys. There also will be several additional tests to make sure you are physically ready for the surgery. You will have a complete physical examination and meet with several health care providers, including the surgeon, who will ask you questions about your condition and your health history. You also will meet with an anesthesiologist, a physician who specializes in sedation and pain relief during and after surgery. Your surgeon or nurse will give you specific instructions to prepare for these tests. You also may ask the health care professionals questions about the procedure at any time during this process. The surgeon will insert a small needle into your abdominal cavity. The needle is connected to sterile tubing. Through the tubing, carbon dioxide is passed into the abdominal cavity to lift the abdominal wall away from the organs below. This space provides your surgeon with an excellent view and more operating space. 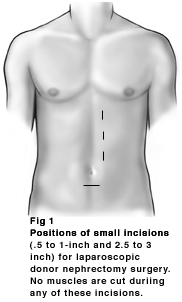 A small keyhole incision will be made near the upper left side of your abdomen. The laparoscope, which is connected to a video camera, is placed through this incision. The image your surgeon sees in the laparoscope is projected onto video monitors placed near the operating table. Before starting the surgery, your surgeon will take a thorough look at your abdominal cavity to make sure that laparoscopy will be safe for you. Two to three additional small incisions will give your surgeon access to the abdominal cavity in order to perform the surgery. None of the incisions cut any muscle. Once the kidney is separated, your surgeon will remove it through a non-muscle cutting incision in your bikini area. Another surgical team will then immediately prepare the kidney for transplant into the recipient while your surgeon completes your procedure. Finally, your surgeon will check that there are no areas of bleeding, empty the carbon dioxide gas from the abdominal cavity and close the small incisions. You may be discharged from the hospital as soon as the day after surgery, or 1 to 2 days later. You may begin to drink clear liquids the morning after surgery. You will gradually be able to eat solid foods (within 2 to 3 days after surgery). You will be encouraged to get out of bed, starting the first day after surgery. The more you move, the less chance for complications such as pneumonia or blood clots in your legs. For 2 to 4 weeks after surgery, do not lift or push anything over 10 pounds. Avoid activities that increase abdominal pressure, especially sit-ups. You may resume normal activities after 2 to 4 weeks. You are encouraged to gradually increase your activity level. Walking will help your general recovery by strengthening your muscles, keeping your blood circulating to prevent blood clots and helping your lungs remain clear. Your incisions will be covered with small pieces of tape (called steri-strips) that will gradually fall off on their own. If the strips do not fall off on their own, your health care provider will remove them at your 2-week follow-up appointment. You may notice some minor swelling around the incisions; this is normal. However, call your health care provider if you have a consistent temperature above 100.5 degrees Fahrenheit, excessive swelling, redness, bleeding or increasing pain. A follow-up appointment will be scheduled about 2 weeks after your surgery. Your surgeon will assess the wound site and your recovery, and will provide further guidelines about your activity and diet at this time. Q. When will I be admitted into the hospital ? Generally, the kidney donor is admitted to the hospital on the morning of the scheduled surgery. Shortly after, you will be prepared for surgery. The recipient of your kidney also will be admitted on the morning of the scheduled surgery to prepare him or her for the transplant. It is very important not to eat or drink anything after midnight before your scheduled surgery. You should expect to stay in the hospital about 1 to 3 days after the surgery. Please bring a robe and any other items you would like to make your stay more comfortable. The kidney recipient will be located in the Transplant Unit, which is designated for transplant patients. The staff is experienced in meeting the needs of transplant patients and their families. You will be admitted to a nursing unit. Q. What happens before surgery ? The nurse will meet with you and your family to discuss what to expect before, during and immediately after surgery. A tube will be placed in your windpipe to help you breathe. A catheter will be placed in your bladder to drain urine. Q. What happens during the kidney donation surgery ? Kidney transplantation involves removing a healthy kidney from your body and placing it into a recipient's body where it can perform all of the functions that a failing kidney cannot. Your kidney will be removed using one of two methods: laparoscopic nephrectomy or open nephrectomy. Laparoscopic nephrectomy is a minimally invasive procedure in which a special camera called a laparoscope is used to produce an inside view of the abdominal cavity to remove a kidney. Laparoscopic kidney removal is considered minimally invasive because it requires three or four small (1-inch or less) incisions rather than one large incision in the abdomen. (See Figure 1 below) . The surgeon will use laparoscopic instruments to separate the kidney. Once your kidney is separated, your surgeon will remove it through a non-muscle cutting incision in the bikini area. Most people are eligible for laparoscopic nephrectomy. Your surgeon will complete a preoperative evaluation to determine whether a laparoscopic nephrectomy is appropriate for you. However, in a small percentage of cases, even approved laparoscopic procedures must be converted to open procedures. During open surgery, the surgeon makes a 6- to 10-inch incision in your abdomen and removes a rib in order to remove the donor kidney. (See Figure 2 below) . Once your kidney is removed (using either surgical procedure), another surgical team will immediately prepare the kidney for transplantation into the recipient while your surgeon completes your procedure. In most cases, your donated kidney will begin performing the work of the recipient's failed kidneys soon after the transplant. Q. How long will the procedure take ? Most kidney donation surgeries take 2.5 to 4 hours. Both laparoscopic and open donor nephrectomy procedures take approximately the same amount of time. However, donor patients who have had laparoscopic surgery experience significantly less discomfort, have a shorter recovery period and return to normal daily activities quicker than donors who have had traditional open surgery. Q. What happens immediately after surgery ? After the surgery, you will be taken to the Post Anesthesia Care Unit (PACU) where you are closely monitored. Your pulse and blood pressure will be checked every 15 minutes. As you recover and "wake up" from the anesthesia, you may experience pain and/or nausea. The IV in your arm and neck will still be in place, and the breathing tube may still be in place. It will be removed once you are alert and breathing on your own. After having anesthesia, it is important for you to change positions, cough and breathe deeply, and move your legs and feet. The nurse will help you with these activities. You will have dressings over your incision sites. The nurse will check the incision sites frequently. Your family may visit you during your recovery for short intervals. Once you recover from the anesthesia and your vital signs are stable, you will be transferred to a nursing unit. Q. Where can my family wait during my surgery ? Family members and friends are invited to wait for you in the Family Waiting Lounge. This waiting area has a play room for small children, a television, reading materials and comfortable chairs. The surgery takes about 2.5 to 4 hours. Visitors are encouraged to come and go as necessary. The Cleveland Clinic has several cafeterias and restaurants, a gift shop and a Health Information Library that may be of interest. We ask visitors to sign in and out of the waiting area so we can find them if necessary. Your surgeon will meet and talk with your family after your operation.